As summer will soon be here, according to the season's of course and not going by the look of the weather we've had recently, I've been busy pinning items that I'd love to have my self! One of my recent boards have been all about summer houses - something only a year and a half ago I wouldn't of been dreaming of at all as we was stuck in the flat! Now though, my dreams can run free with gardens, instead of dreaming for a garden of some sort, I can now let my imagination run free with what I'd like in my garden. When I was younger, I never really paid flowers too much attention, but now I'm older and have my own garden I really can see the beauty in them, so once all the flowering is done, I would love one day to be able to walk down to the bottom of my garden, and find myself unlocking a summer house! Some people would like a conservatory, some people would like decking, some people would like a football court, whilst some think of the garden as the last place they'd like to be, and I dream of a summer house. Somewhere I can relax in the summer on my days off whilst Spud plays with his garden toys or spends time in his pool, a summerhouse that can be sound protected for garden gatherings so I don't annoy the neighbours gone 8pm, a summer house I can call my own - because I can't keep pretending my brother's house is mine aha! 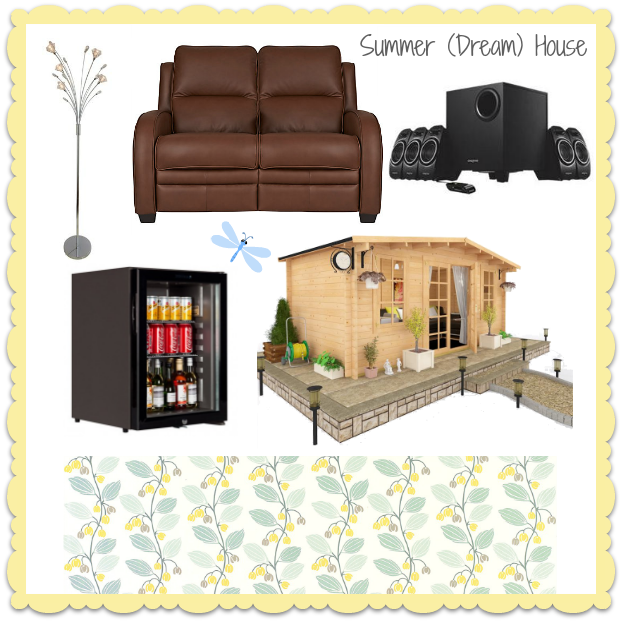 I've put together this board, to remind myself in the future (when I finally get around to doing my garden), of what I would love in my dream summer house! 1 - Glass Flower Floor Lamp - Homebase. I can just imagine the setting now, Spud is enjoying the last of the summer sun, playing on his swing, it's 7pm, it's not dark, but it's not light, I'm laid on the sofa in the summer house reading a summer novel, reading with the light of this beautiful stylish, trendy and summery style lamp! Every summer house needs a seating area to relax, and whilst we can have garden tables and chairs in our gardens, we can't have sofa's like our homes lounges! This is just one of the Parker Knoll sofas that I've took an interest to, I'm not keen on the colour, but love the design! If only it was a gray! However, by the time I have the funds, I'm sure new designs will be out! The whole point of a summer house in my opinion is living in the house near enough during the summer! I have quite a long garden and when relaxing in the summer house I wouldn't want to have to keep going back indoors for various things, so a mini bar/fridge is an essential for me and Spud to keep hydrated during the hot summer days! It'll also be great for any garden parties/gatherings I host! The summer house itself of course! I think it's going to be around five years time until I actually have the funds to get things moving, so I'm hoping I'll be able to find a bigger summer house in this kind of design when I'm ready! This log cabin is lovely, and with my own touches put in place, it will be the perfect dream summer house! I love wallpaper, and although I've never seen anyone else with a summer house that has wallpaper, I really don't care! I love this wallpaper especially, it's full of colours I love, it's summery, it's modern, it's flowery - it's just perfect! I know once you bring in a certain wallpaper you have to be careful with the other items in the room though! For now though, it's perfect! If you could design your dream summer house, what's the number one must have for it? Leave me a comment and let me know!